In Part One of this blog, I discussed the ways in which electronic word of mouth (eWOM) marketing and peer interactions on social media influence a consumer’s intent to purchase from a brand. In Part Two, I will dive into the do’s and don’ts of public engagement and customer service on social media. Let’s face it, everyone makes mistakes. However, when a brand receives unwanted attention for inappropriate engagement with its online consumers, it surpasses a mistake and becomes a PR disaster. Usually these interactions are meant to be harmless, but remember that anything written could be misconstrued, especially when it is on a public social media platform. 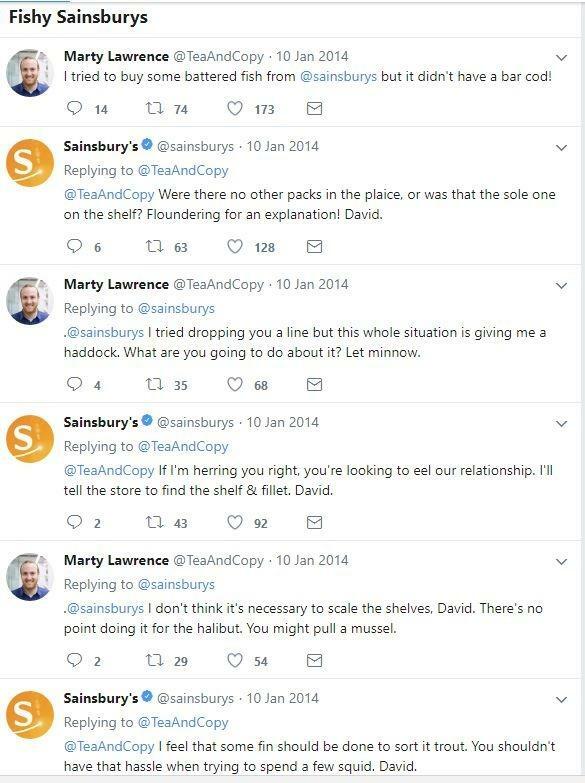 Brands sometimes get so lost in trying to be ‘trendy’ on social media that they forget to put the consumer first and treat interactions with a degree of professionalism. Follow these do’s and don’ts to keep your audience happy and increase public engagement. Have a Voice. Brand identity is everything — I’m sure you’ve heard that before, but it’s true. When interacting online, think about what the public should know and how they should feel about the brand. Develop a common vocabulary, aesthetic, and communication style that is consistent with the brand’s business and social objectives. 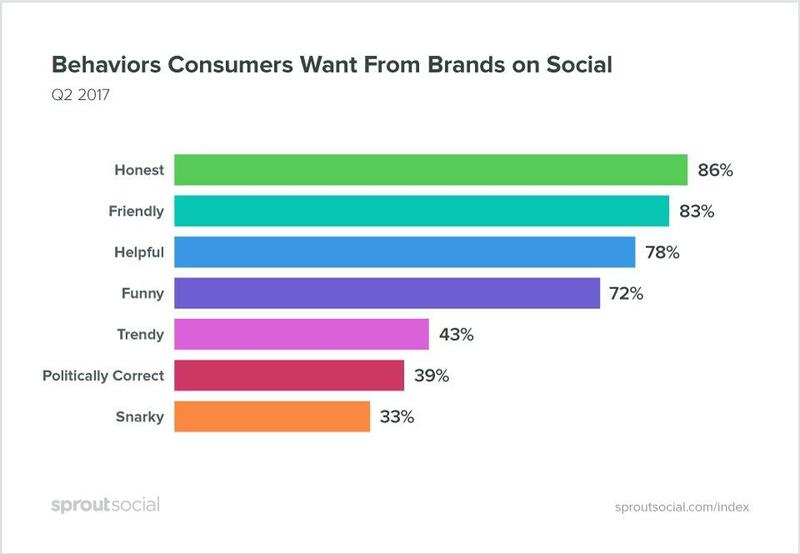 According to The Q2 2017 Sprout Social Index, consumers appreciate brands who practice authenticity and honest communication. Stay true to the brand, and avoid online trends that suggest making drastic voice and style alterations, as this may confuse consumers. Before posting, commenting or responding, consider how the messaging reflects the overall brand identity, and remember, honesty is the best policy. Be Visual. As cliche as it may sound, a picture really is worth a thousand words. Add some creativity by communicating through visuals such as photos, emojis, GIFs, and videos. Minimal text gives a brand more creative freedom to integrate different content that reveals its personality and provides a well-rounded image for the consumer. Develop a brand style guide that includes consistent colors, fonts and designs that look great on all social platforms. Coca-Cola does a great job illustrating its personality through visuals, with all social pages sharing a consistent look and feel, including the infamous Coca-Cola red color. Be Funny. Or better yet, be funny with caution. Many brands have fallen into situations where attempted humor has come across as offensive. To play it safe, use humor in the most positive and lighthearted ways possible, and make sure the content relates back to the brand messaging. Even if a joke seems great, triple check it with other team members to be certain it aligns with brand voice, and doesn’t possess any potentially offensive statements or innuendos. If done correctly, humor can increase overall brand engagement. 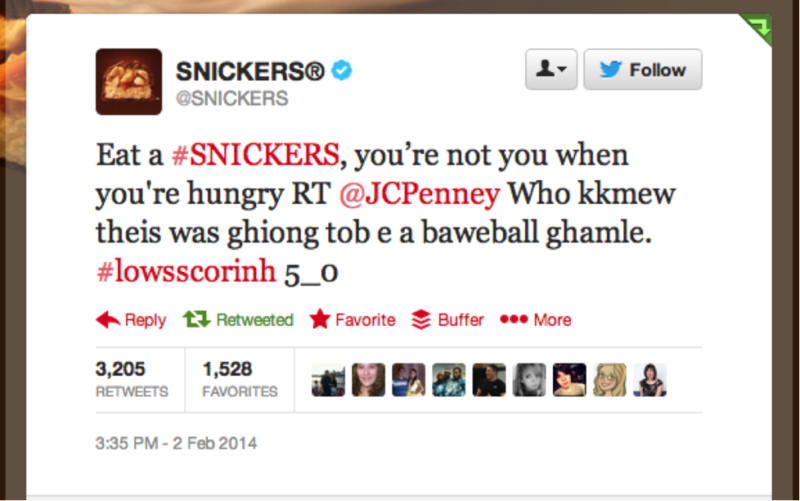 See how Snickers engaged with JC Penny’s ‘drunk’ superbowl tweet to relay brand messaging in a lighthearted, funny way. Be Snarky. Brands often make the mistake of being snarky when they mean to be humorous — a misstep that can land you in hot water, as you don’t ever want to publicly humiliate anyone for the sake of a laugh. Unless a brand is super well established, like Wendy’s, who took some changes with their humor recently, the safest route is to refrain from snarkiness and similar off-color messaging when interacting with consumers on social media. In the end, consumers are the ones who determine a brand’s success. When they feel disrespected or publicly humiliated by a brand, they will unfollow the brand’s social media accounts. About a quarter of consumers will even boycott a brand after seeing a distasteful interaction on social media. When in doubt, remember that throwing fire on fire doesn’t help anyone. Discuss Controversial Topics. Always keep in mind that any social media post could be interpreted as offensive. Therefore, brands should steer clear from controversial topics, such as politics, religion, and race, unless the brand has a direct affiliation with such topics or societal issues. Post Without Researching. There are also instances in which a brand might post content with innocent intentions, but is still deemed offensive and ignorant. 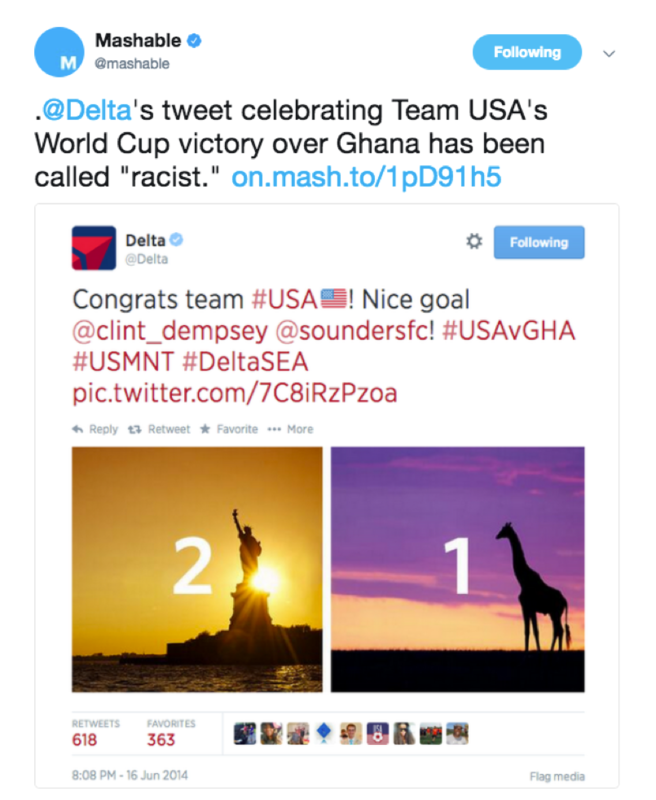 One example is Delta Airlines’ World Cup tweet in which the brand was trying to create a distinguishable photo that represents the USA and Ghana. However, Delta neglected to research if giraffes live in Ghana (they don’t), and many thought the brand was ignorantly blending the countries within the continent of Africa. Although the mistake appeared as harmless to some, others accused the brand of being racist. Customer service is no longer simply a private message or phone call between a consumer and a brand. Today, consumers prefer to voice their issues on a public online platform, and brands have had to adapt to this. 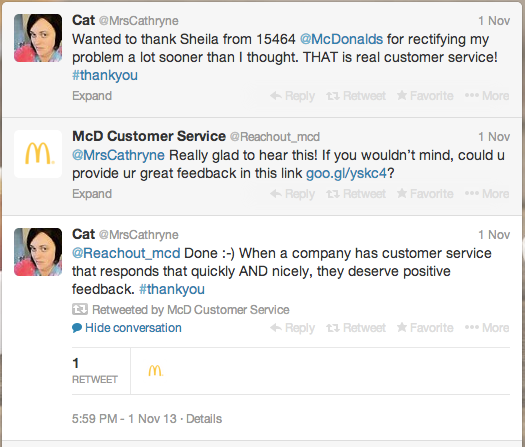 Social media allows consumer-brand customer service interactions to simultaneously serve as online reviews. Therefore, the way a brand handles these consumer posts can determine their reputation. Be Personable. Consumers turn to social media for customer service because they assume they will be able to quickly communicate with another person instead of a machine. They expect to have a helpful and personable conversation with the brand as a person and not an entity. With this in mind, ditch the robotic, serious tone for a fun voice that communicates honesty and transparency. Interpret their inquiries as serious problems and handle them personally while maintaining the brand voice. Ignore Negative Feedback. 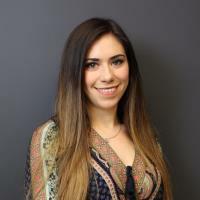 How a brand handles negative feedback holds a strong weight on their future success. It is imperative for brands to respond to all consumer inquiries they receive on social media so their audience feels valued. Have multiple approved response templates ready for negative comments, and personalize them to fit each consumer’s needs. Be careful not to sound too repetitive with responses since consumers want a brand to individualize their needs. Need an example of what NOT to do? 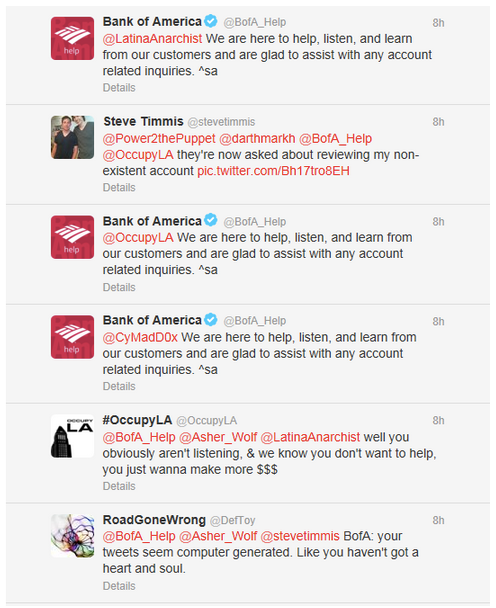 Check out Bank of America’s fail at automated responses which made consumers feel ignored. Argue With the Consumer. Private, one-on-one online communication does not exist. Even if a brand is responding to a consumers private or public inquiry on social media, it can still be seen by the public (i.e. screenshots). Remember the golden rule: the customer is always right. Do not be defensive or argumentative; instead be proactive and offer solutions to fix the customer’s negative perception (ex. offer a free product or discount). If the situation is uncomfortable to handle publicly, ask to take the conversation to a DM. Never be like Amy’s Baking Company which engaged in public negative feedback without a strategy. Use the tips in this article to help you think twice before posting on social media. Something that may seem insignificant can easily be blown out of proportion and turn into a PR disaster. When in doubt, turn to these do’s and don’ts to double check your messaging and keep in tune with your brand.